We are very proud to announce that PSU students Stephen James, Adam McSorley, Jesse Pollard and Camille Walker are the first to make a physical improvement to an alley in the Portland Metro area using the Alley Allies principles and tools. The goal with Alley Allies was not just to improve alleys in the short-term, but to reimagine them as vital resources for activating and strengthening communities permanently. 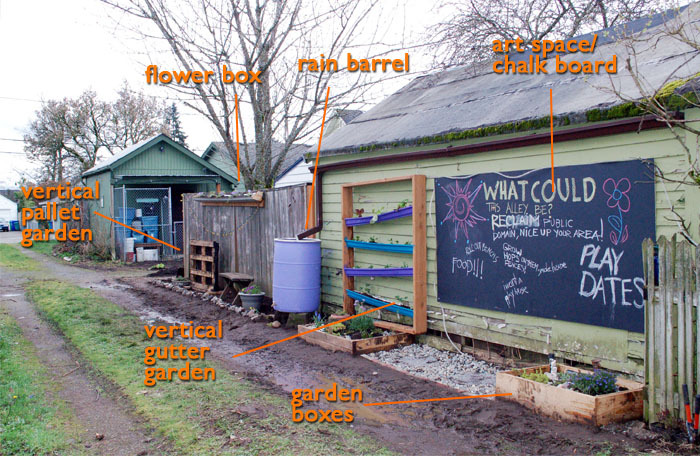 To this end, our strategies begin with community organizing, building a shared vision for this public space and establishing a long-term plan for alley use and maintenance. In just 10 weeks, four undergraduate students achieved this with their capstone project “Alley7172”. Derek Dauphin from Mill Street served as the students capstone mentor and writes about the student’s approach below. 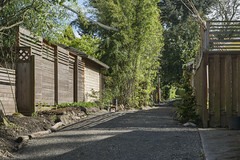 One of the students, Adam McSorley, lived on the alley between 71st and 72nd Streets and Rhone and Center Streets in Southeast Portland and was inspired by the Alley Allies concept. The students went door-to-door over a few days and interviewed each resident on the alley to gauge interest in the project. They were surprised to find that not only were residents interested in a project, they already had ideas about what to do. The students spread the word that they would be hosting an event at Adam’s house and that all were invited. They provided snacks and facilitated a conversation with residents about how to proceed using the templates provided in the Alley Allies Toolkit. They also used the skills and equipment inventory template in the Toolkit to understand what resources the block has at its disposal for making improvements without spending any money. 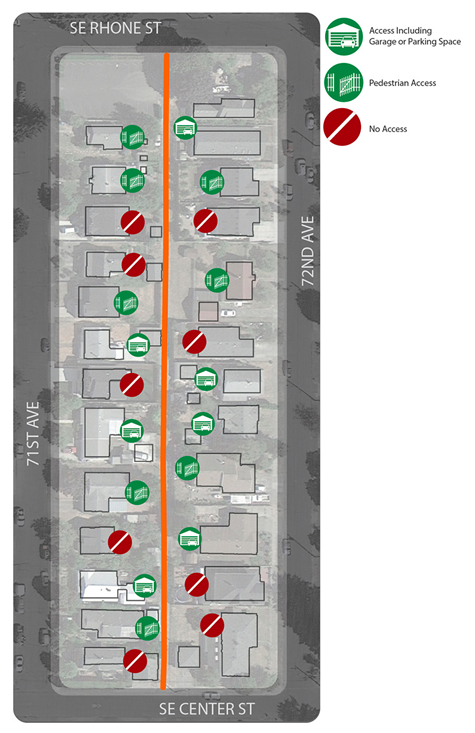 The students also developed an existing conditions map that showed which residents had access to the alley and whether that access was for a car or just a gate to walk through (see their map at the end of this post). The end product of the meeting was a phased plan, starting by improving a small section of the alley to build capacity and inspiration for improving the rest of the alley. The students salvaged discarded wood and crates for planter boxes and vertical planting walls and purchased chalk board paint and wood for a community board. A local soap manufacturer donated barrels to create a rainwater system since residents reported not being able to get watering hoses to the alley. 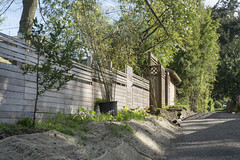 The students and neighbors used their tools and skills to make improvements to a portion of the alley where residents on both sides of the alley were excited about making changes. A City permit allowed them to shut down access to the alley and create a tented space for residents to come, have a drink or snack and see the improvements. This provided an opportunity to further the discussion for the rest of the alley and helped them fill up their community chalkboard with ideas for what the alley could be. At their house party and the block party, residents had lots of ideas for things to do in the alley, so the students created a calendar of these ideas that keep people coming to and thinking about the alley as the weather gets better. The Institute for Sustainable Solutions has taken an interest in the students’ project and we are working with both parties to establish a path for continuing these kinds of student-led projects in alleys through a variety of funding strategies and sources. 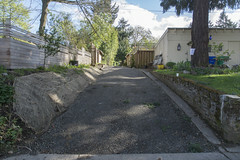 Learn more about alley capstone projects like this one here. The students created an alley access map by surveying the alley and used this to start the discussion about the alley. We think this is a great idea and wanted to show you what it looked like. Knowing who has access or wants it and why is a key first step in understanding what kinds of improvements are possible and who is likely to be interested in grabbing a shovel to help out.